Calling the FH-1 Hunter an attack helicopter might be misleading, because this thing is in a class of its own. Its unique rocket barrage alone is enough to eviscerate an army of foes, and that’s before you consider your buddy’s contributions at the helm of the gunner-operated Turret. Can you hear it? The sweet cacophony of exploding aircraft and Homing Missiles whizzing through the sky. Your enemies should be so grateful. 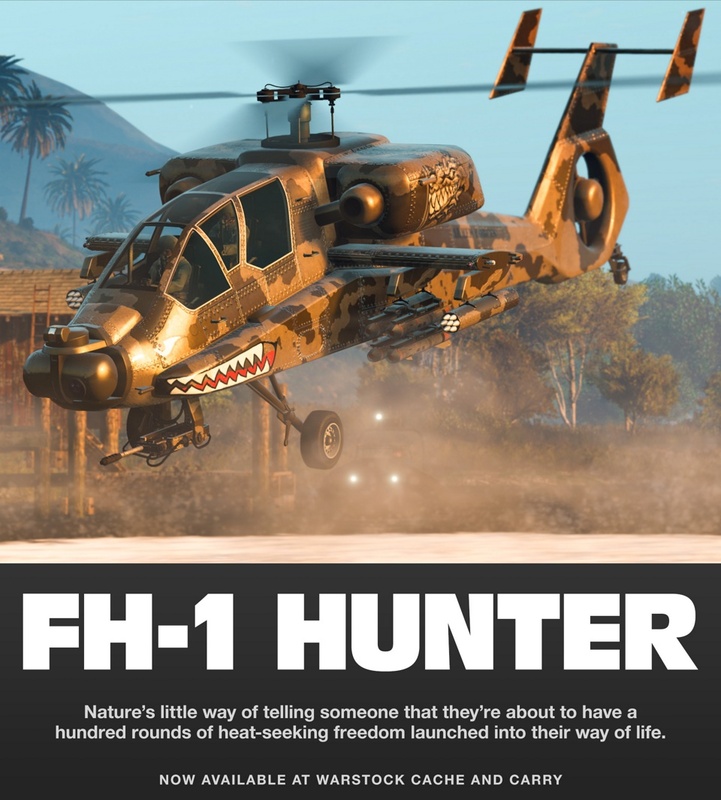 Pick up your FH-1 Hunter today from Warstock Cache and Carry. 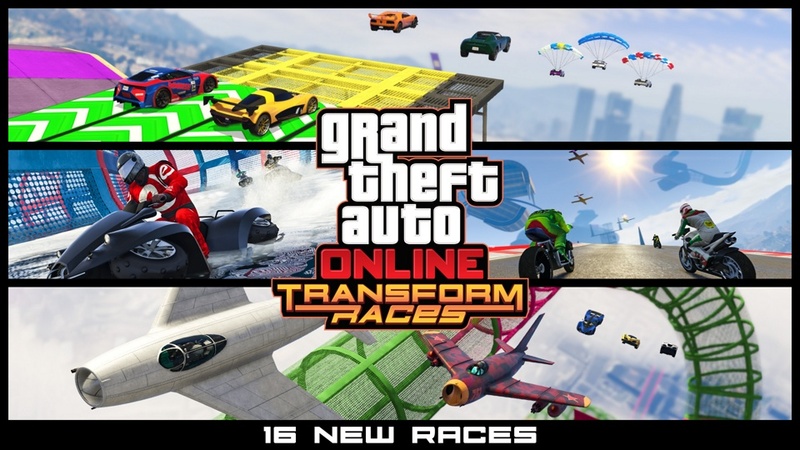 A whopping 16 new Transform Races have arrived in GTA Online, serving up more thrills and spills for those willing to risk life and limb for glory. Competing in any Transform Race between now and November 27th will also grant you Double GTA$ & RP, so hit the Stunt Tubes and earn big while you can. To get right into to any of the new Races, hit the links below to bookmark them on Social Club and get instant access the next time you hop in game. From the game, tap the boot button from the loading screen or hit any one of the Transform Race Series icons scattered across the map. Whatever you make of Jock Cranley’s politics, we can all agree that stunt jumping in Southern San Andreas wouldn’t have been the same without his trademark, bulge-hugging attire. 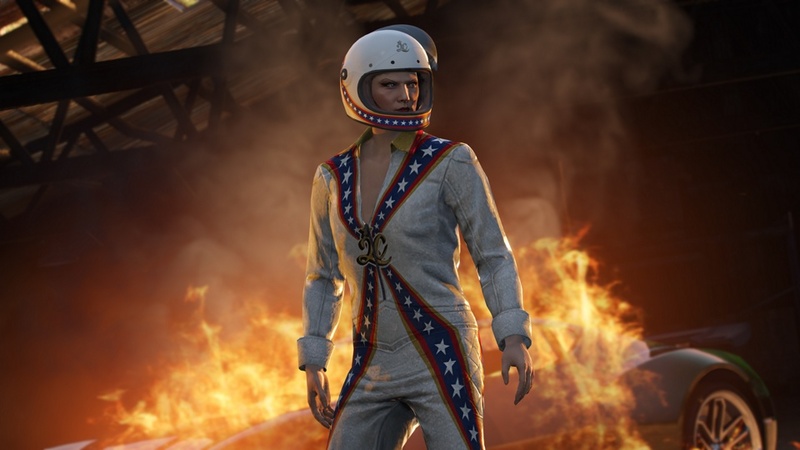 Grab yourself a piece of history with the White Jock Cranley Jumpsuit — a free in-game unlock for all who log in to GTA Online between now and November 27th. Give your fleet of racing vehicles an edge or simply satiate your lust for petrol and burnt rubber with these discounts on cars and automotive upgrades, going on all week long. And be sure to stay tuned for some big discounts coming later this week for Black Friday. Time Trial — “End To End”. Launch Premium Races through the Quick Job App on your in-game phone or via the yellow corona at Legion Square. The top three finishers will earn GTA$ and you’ll get Triple RP regardless of where you place. To take a shot at the Time Trial, set a waypoint to the marker on your in-game map and enter via the purple corona. Beat par time and you’ll be duly rewarded with GTA$ & RP.